Are you ready for a professional change? Whether you’re daydreaming about retirement but want to ensure you have extra income, fantasising about building your own business empire or itching to get out of the office and become your own boss, vending machine franchises present flexible and workable next steps. 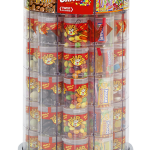 Completely scalable to suit your lifestyle, sweet tower vending machine franchises (like our packages at Tubz) can generate as much as £72,200 gross profits per annum, or take up as little as 2 hours of your time per week, depending on your goals and resources. You can find out more about our potential profits, and what you might be able to expect to earn on our business bundles page. So is vending the business for you? At Tubz we work with an incredibly diverse range of individuals. Our franchisees come from all over the UK, from all backgrounds, of all ages, with completely different professional experiences; from stay-at-home parents and eager young entrepreneurs, to retired individuals and tradespeople seeking flexible additional income. That means vending machine franchises are the business for everybody! In order to visit your vending tower locations in order to check and refill machines, you will need to have access to a vehicle that is also able to transport your vending towers. At least two hours a week are required to maintain our smallest vending franchise option. Many of our franchisees choose to spend considerably more time on their franchises, but this is completely up to you. Depending on the number of sweet vending machine towers you choose to operate, you may need space to store machines that are not yet at sites. Some Tubz franchisees have been self-employed for decades, others are totally new to working for themselves. Whether you have experience being your own boss or not is unimportant, what really matters is that you’re driven to make your sweet vending machine business a success and will stick at it until it is! Our smaller packages are relatively simple to organise, but at the other end of the spectrum, with 100 towers to keep topped up and locations to monitor, organisational abilities will become crucial to your success. Your vending machine towers are your responsibility, which means you need to be prepared to take initiative. If a location isn’t performing well, raising this with your franchisor is crucial. If you’re selling out faster than anticipated, it’s down to you to expand your business. Rest assured though that the Tubz team do offer support on an ongoing basis, so if you have issues, new goals or want to built your empire further, get in touch. Do you think Tubz sweet tower vending machines could be the right next step for you? We’d love to show you a little more of what we do. To find out more about our system, rates and bundles, explore our website or get in touch today via info@tubzbrands.co.uk or on 0845 601 900.